Before you start looking for cheap wholesale jewelry, you need to be clear in your own mind what you mean by cheap. Are you looking for cheaply made jewelry, or for bargain prices on fine jewelry? Your answer to this this question will determine where you go to find this “cheap” jewelry. If you are looking for costume jewelry, your best bet is to buy in bulk directly from a jewelry wholesaler. This will enable you to get the best price on cheap wholesale jewelry. Of course, this option isn’t ideal for an individual buying jewelry for their own use and pleasure. However, it is a good way to get an inventory of costume jewelry for resale. If you are looking for bargains on fine jewelry, you can also buy in bulk from a wholesaler, or get wholesale prices on individual pieces from an auction site. Because you have more room to add a markup on fine jewelry that you purchase at auction at rock bottom prices, this is a good method to use to build up an inventory for resale. It is more labor-intensive than buying a whole bundle of pieces at once, but you can get a more diverse inventory this way. Online auction sites that break their own wholesale purchases into individual lots are also great places for individuals to shop for jewelry for personal use or gifts. 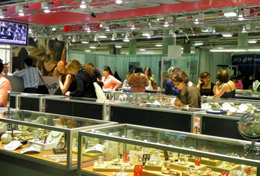 Whether you are buying cheap wholesale jewelry for business or pleasure, you need to know how to work the auction sites. This requires patience, dedication, and research. First make sure you are focusing on the right auction site or sites. You want to look for a site that offers plenty of no-reserve auctions. Because no-reserve auctions have no minimum sale price, you can start bidding as low as $1. This offers the best chance to snap up jewelry at far below its actual retail value. You also want to make sure you are using a reputable site with adequate customer protections in place. Look for detailed jewelry descriptions, clear photos, a reasonable return policy, and good customer feedback. One final consideration when choosing an auction site is the amount of traffic. Ideally, the less competition you have when bidding on jewelry the better. This doesn’t necessarily mean you have to confine yourself to sites no one’s ever heard of. You can avoid the competition at big-name sites like eBay simply by focusing on specialty jewelry that doesn’t get a lot of bids. Next, begin observing auctions on your chosen site or sites. You will probably want to observe several auction cycles before you begin bidding. This may be hard to do, but if you have the willpower to sit out a few rounds, you will be able to start seeing patterns in the way other bidders behave. You may be able to identify times when bidding is slow and you can swoop in and steal the prize. You may also discover that most of the bidding happens 2 hours before close, so you might as well save your own bids until then too in order to avoid pushing up the price more than necessary or feeling the frustration of getting outbid early on. Study the prices of closed auctions as well. Often, wholesale jewelry auction sites are trying to unload many copies of the same item, but they split them into separate auctions in order to create a false sense of competition for the pieces. In other words, rather than letting the five bidders that are interested in a certain jade pendant each bid on a separate listing, the auction company wants them all to bid at once to drive up the price. Then they will post a second, identical pendant and repeat the process. If you look at the closed auctions carefully, you will begin to recognize repeat items. Use this information to help you create your bids on similar items. After all, if you see lots of diamond earrings in the closed listings, chances are good that the wholesaler still has more to auction off. So you can bow out of the bidding once it surpasses your budget and just wait for another set of earrings to go up on the auction block, hoping you’ll have a better chance at winning next time. If you are interested in buying cheap wholesale jewelry for resale, obviously getting a good price is a big concern. However, you can’t just snap up whatever is cheap at auction and just assume you will be able to turn a profit. You also need to take care to develop an inventory of appealing pieces you can actually sell! Here are some guidelines for building a resale inventory from cheap wholesale jewelry auctions. First of all, identify your resale venue. Will you be reposting the items you purchase to an auction site like eBay? Or will you be selling the jewelry in person at a resale shop or market stall? Where you plan to sell the jewelry will affect the types and styles of jewelry you want to purchase. For example, if you plan to set up a table at a fair in your town, you will want to focus on less expensive items with semi-precious gems, and brass, sterling silver, or gold-plated metals rather than solid gold jewelry. That way, casual shoppers will be able to afford your wares. Next, think a little bit about your customer demographics. Who might your customers be? What type of jewelry appeals to them? If you plan to repost your jewelry to an auction site, you will have access to a huge customer base, and you won’t have to worry so much about what type of jewelry you buy. If, however, you sell in person, you might find that your main client base is young and hip or old and conservative. You need to tailor your purchases to suit their tastes if you hope to sell a lot of jewelry. After you’ve thought carefully about where to find your cheap wholesale jewelry and what types of jewelry to purchase, you’re ready to start bidding at online auction sites. Enjoy!